a new piece of Chunky Rice art — a birthday card for my mom, actually — continuing with the Hawaiian theme. hi craig, would you be interested in giving an interview to a group of illustrators from kingston university, london? it could be a telephone interview, or by email. whaddaya say? 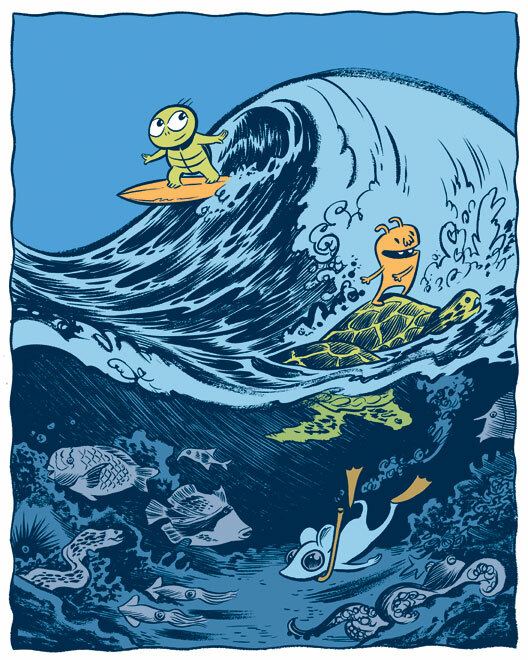 Those are some really gorgeously cartooned sea creatures. Thanks for posting that! Happy Birthday to your mom, Craig! That is lovely! Chunky Rice is one of the sweetest looking characters I’ve ever seen. I’m kinda jealous that your mom gets all the cool artwork. I hope you make greeting cards cover art along with all the other great things that you do. I love how this sort of melds your old and new styles. It feels a lot more relaxed than most of the perfect curves throughout chunky rice. I discovered you with Chunky Rice, and I have to say that I fell in love with it! There aren’t only lovely characters and an emotional story, for me every picture in that book is a great work of art. I think exactly the same about Blankets. so, I can only say: congratulations for your brilliant work. thank you for inspiring me to pick up the brush and give it another shot – i wouldn’t have had the patience to make the transition from marker pens without having seen the beautiful works you produce. and habibi looks incredible by the way, i look forward to reading it! Sigh. I am absolutely in love with your two books and can’t can’t just can’t wait for more. It’s just priceless. Godliness, if I may say so. This illustration is absolutely fabulous. is there going to be more chunky rice series books?